This weekend’s sailboat activity was a disaster! Daddy’s boat sunk as spectacularly as Henry VIII’s Mary Rose, and now lies at the bottom of the deep blue swimming pool. The Saturday hadn’t started off too badly. Following up on my article on introducing design based thinking to young children, we decided to make a sailboat. Now Lucas from the very start become fixated on making sure Brother Dadu (one of four toy giraffes) could fit safely into the boat, and this seemed to factor into nearly every design decision we made. Daddy: Which one will be the best for a sailboat? As this activity was designed to introduce some of the concepts of prototyping, I encouraged Lucas to offer a little more of an explanation for his decision. Daddy: Ok, but which one will be the best in the water? Remember our sailboat will be going into the water. Lucas: I think this one because it’s the biggest. 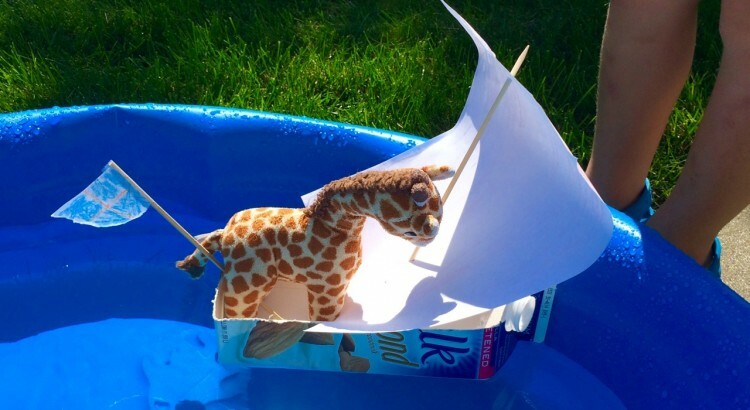 This is an example of how a toy giraffe sabotaged my perfectly thought out sailboat/prototyping activity. It was all about making sure that Brother Dadu, could fit in his boat, but sometimes it’s important that we go where our little ones take us, so I let him choose milk carton, and I selected a plastic bottle and said this was going to be Daddy’s boat. Interestingly, his observation this time was a little more on point. Lucas: Yeah, but I think this one is not good because it might fall over. After we cut out what will become the hull for each of the two boats, we turned out attention to material for the sail. We had a little more success at this part of the activity, as Lucas was assured Brother Dadu could fit into his milk carton, he was able to think a little more about making the sailboat actually work. Daddy: What’s the best material for a sail? 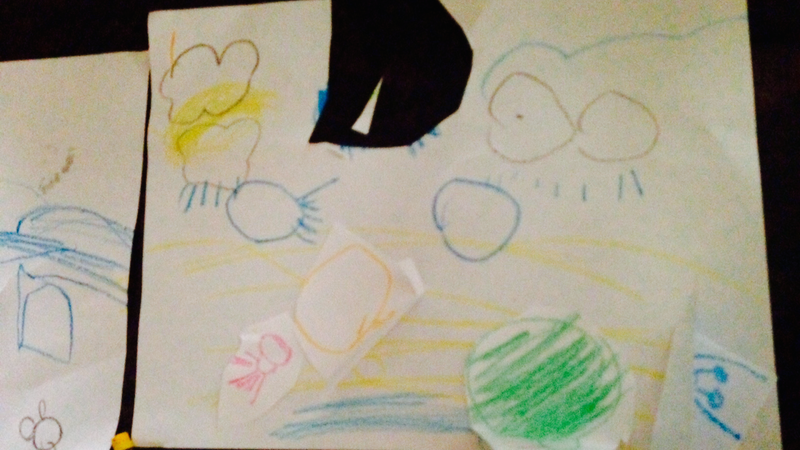 Lucas: This one will blow the best because it’s made of paper and paper can blow away in the wind. We made two different sails, Lucas called one the Lollypop Sail, and the other the Normal Sail. Daddy had to use the Lolly Pop Sail! We used furniture pads to hold the masts in place, and at this point Lucas soon began to concern himself again with space for Brother Dadu. so we had to relocate the mast, which meant detaching the furniture pads, but Lucas was now starting to think like a designer, and in some ways was even thinking of the end user – his toy giraffe! We tested our boats in a little paddling pool, but had to wait until the following morning to put them into the ocean (the swimming pool). , and during the night one of the sails had became a little loose. Lucas: Daddy, the Lollypop sail is a little bit shaky. But this wasn’t a major concern because it was in Daddy’s boat. At the pool Lucas wasn’t interested in actually testing the sails, and only cared about placing Brother Dadu in his boat, which he did successfully, but eventually he fell into the water. At this point the rest of the activity was centered on making a really tight seat belt, but he didn’t fall in after this, and his sailboat was a success. Mine on the other hand, sunk within a few seconds of setting off from port. Creativity in Education: Exploring the Imbalance, is a documentary film that explores Creativity in education. The film is available on Amazon or can be access for free by simply commenting below or subscribing here. 7 Ways to Cultivate Creativity is a FREE eBook for parents who want are looking for ideas on how to cultivate creative thinking skills at home. Subscribe here to download the book. My daughter’s minor basketball injury sent us hurrying to the 24 hr walk-in clinic. But the tension in the waiting room melted away thanks to a spontaneous outburst of creative play. 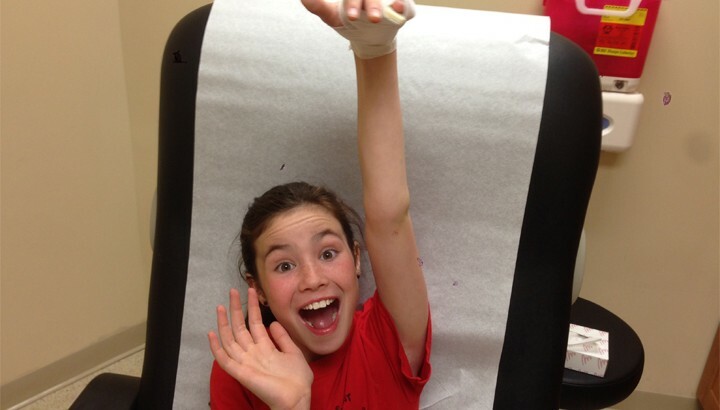 Ten year-old Natalie sat between my wife and me – staring at her disturbingly swollen finger. Her nervousness and discomfort silenced her usual playful self. She watched as I picked up six pages of forms. And then it began. Innocently enough. But once it did – there was no turning back. My daughter saw me write: Jonathan Flash Furst. I sketched a stick-figure hand with a cartoon-like throbbing finger. Natalie laughed – took the pen & drew a HUGE BOLD ARROW pointing to the injury! As she sat down with forms, she made a second call and repeated everything she said in the first call – but louder. Finally she finished. There was silence in the clinic. I saw Natalie’s face light up – tuning in to what we’ve done since she could string sentences together: creating a story on the fly. Look for opportunities to use your creative skills – playfully. Engage in structured activities for exercising your creativity – BUT also open up to spontaneous opportunities where you can create on the fly. Exercising creative thinking skills = Exercising your imagination. Run with the spontaneity. Natalie and I leapt on a spontaneous moment. An imaginative dance took form. And isn’t it ironic for parents that once we open up and “really play” – this experience feels so familiar because it reminds us of the young kid in us – who had such open access to imagination and creativity. -imaginary friends, dress-up games, Barbies, creating tents & forts in our rooms or the woods, amazing buildings with blocks and Legos, designing worlds & scenarios with small toy figures and on and on…. As parents it so much fun to share sparks of creativity with our kids. Entries on our blog have listed many cool activities you can share with your kids. Unfortunately, we’re not super sophisticated (or perhaps lack creativity) so in order for us to know that you’ve shared content we need you to tweet to @dads4creativity or share from our Facebook page. My boy has always enjoyed drawing, give him some crayons, paper, scissors, and a stapler, and he’ll happily work independently to produce his latest adventure book. However, this month I’ve noticed a subtle change in his use of these tools. Rather than making books to express his imagination, he’s started to play games. Like his book designs, he starts by drawing something that he’s recently been exposed to or learn about in school. (This morning it was about Hermit Crabs, though I don’t really know what these are or where they came from). After he’s drawn and colored his characters, he cuts them out and uses them as props or puppets in his play. 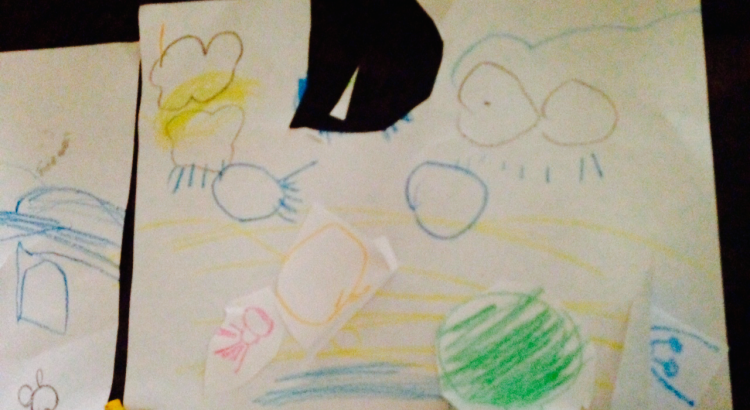 He then takes another piece of paper (or multiple pieces of paper) and draws the setting for his game. Today it was London, but other times it’s a different continent world depending on whether it’s set on earth or in space. Once all the pieces are assembled together, he embarks on a massive interactive story experience, and it’s really wondrous to watch. This morning the Hermit Crabs, and their separate shells, went to visit my mom in London, he felt the need to call her via FaceTime so that she could join in the game – which she happily did, and with her help he added, modified, and erased (or scribbled over) items from his paper to keep up with the evolving story. I’ve also noticed that the drawings appear more simple and less time is spent then when he typically draws – perhaps this is because of the speed in which the characters change. Notice the sun and the weather clouds. They were drawn at different points in the evolving story. Interestingly enough he rejected my offer to help improve the design of his paper puppets by trying to attach a stick – obviously he’s content and I should know better and not interfere with his setup. Anyway, this has got me thinking about ways one might cultivate this type of interactive experience with paper crayons, so I’ve reflected on his journey and shared my theory on how this activity evolved from simply drawing. Below are seven things that I think have played a part in his ability to generate and interact with the stories that he create – feel free to let me know if I’m missing anymore! Read, Read, Read! There’s an overwhelming amount of evidence about how important it is to read to your children. We started reading to Lucas when he was three months, and buy nine months it was certainly a well established routine. He now absolutely loves books, but more importantly the stories that are locked up inside. I’m working on his younger brother now, but confess I’ve started a little late – yep second child syndrome here we come! Expose your children to different topics. See it as a library of ideas that they can draw upon in their games and drawings. Try and show picture of videos via the Internet. If he or she is talking about snakes – show videos and pictures of snakes. Find a supply of cheep paper and crayons and don’t get too setemental – you cannot keep EVERY thing they produce when it’s in mass quantity like Lucas – who needs a plain piece of paper for every new game. Scrap paper does not suffice. Made a conscious effort to integrate paper and crayons into his play when out in public – I’m saying this because I am a conscious effort to avoid becoming over reliant on the iPad*. Early on we asked questions about his drawings, and praised the detail of his imagination as opposed to focusing on his drawing skills. Though we also played some drawing tutorials on YouTube, which he seemed to like. I’ve discussed with him the idea that most stories have a beginning, middle, and end. I accompany this with an effort to avoid bringing the game or story to an abrupt end because it’s bath time. Instead I suggest that you try and give advanced warning when they need to rap it up and if this isn’t working sit down with them and help facilitate it’s conclusion. Finally, be sure to sit down and challenge them to share the creation. This is important because part of storytelling, it ‘telling’ the story. They need an audience, which is why I think he wanted to call my mom this morning, as both myself, and the wife were busy getting ready for work. 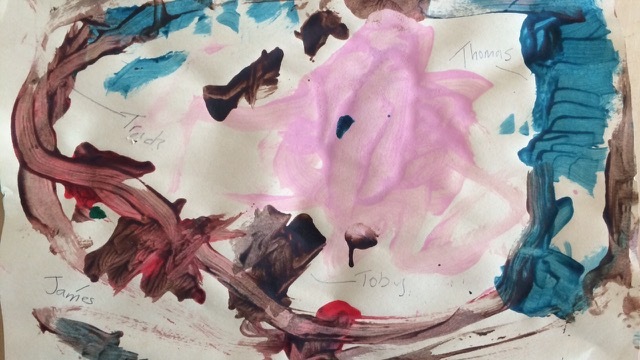 One of Lucas’s first paintings. Notice how the colors represent different engines from Thomas the Tank Engine. I think there’s a lot more to this story and I’m really loving the concept of an interactive story generated with paper and crayons, but unfortunately my train has arrived at the station and so I must depart. *We’re going through so much paper so recently I’ve actually tried to encourage him to draw on the iPad, but he’s not having it! 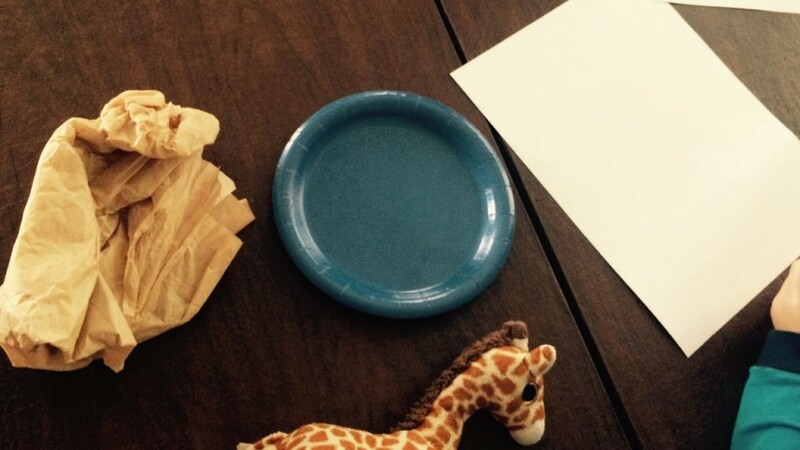 I keep noticing these forget-me-not moments of everyday creativity when engaging in play with my boys, the types of things that I never really thought about until I began writing this blog. They’re really simple… for example lets take Lucas’s favorite toy from his twos and three – Thomas the Tank Engine. Naturally we bought a wooden railway to support his first obsession. At first there was one obvious track formation – the figure of eight. I tried a few different variants but they were never as good, and would put strain on some of the pieces. Slowly overtime we added to the set by buying a bridge here, and a tunnel there, before we knew it we had the ability to create a variety of different track formations by just adding one or two pieces. 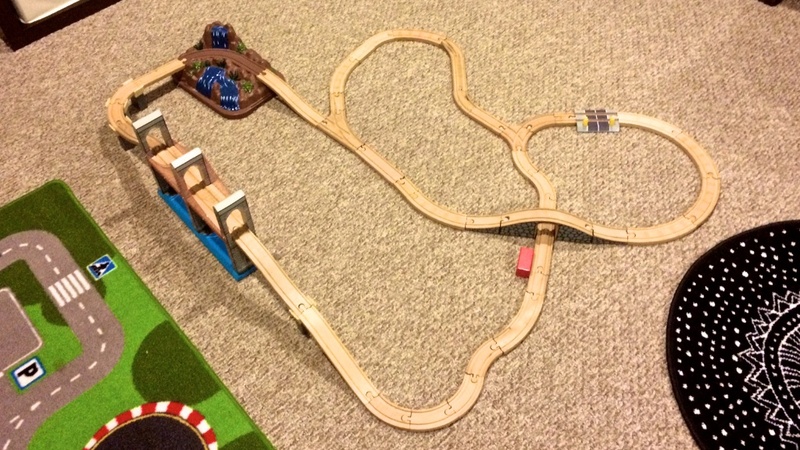 Eventually it became a challenge for me to build a different track each evening. My wife would sometimes get mad when I would respond to her calls late, but I was fixated on trying to jiggle the last pieces in a way that would make my latest variation work. It even became a game between Lucas, and me, as he would begin playing at one end of the track, as I rushed to finish the other end before the engines arrived. I confess that I would even try and influence Lucas in the shop when we were looking for additional pieces. That extra bend or fork in the track would make all the difference to our, or shall I say ‘my’ future creation. Obviously, this would be a challenging task to pass on to a two year old, especially unaided, but it certainly got me thinking about what other things I could ‘tinker’ with just to be different, to engage my originality and take notice of the forget-me-not moments of everyday creativity when playing with my boys. As Lucas’s games have evolved I’ve noticed that originality play a big part in their design. He never made the same track twice, and the characters that appear in his games regularly change. I doubt this has anything to do with my track obsession, but it certainly has me thinking about how we might develop a tolerance for ambiguity and better appreciate differentiation in play. Ultimately, why would Lucas build the same track twice, he’s certainly never experienced the ‘correct’ way for it to be assembled? Now the greatest challenge right now is for me to practice what I breach and bring this theory into our Legos, for I am finding it really hard to accept that Lighting McQueen has a place in our recently built Lego Village – anyone seen Lego Movie? Yeah that’s going to be me!